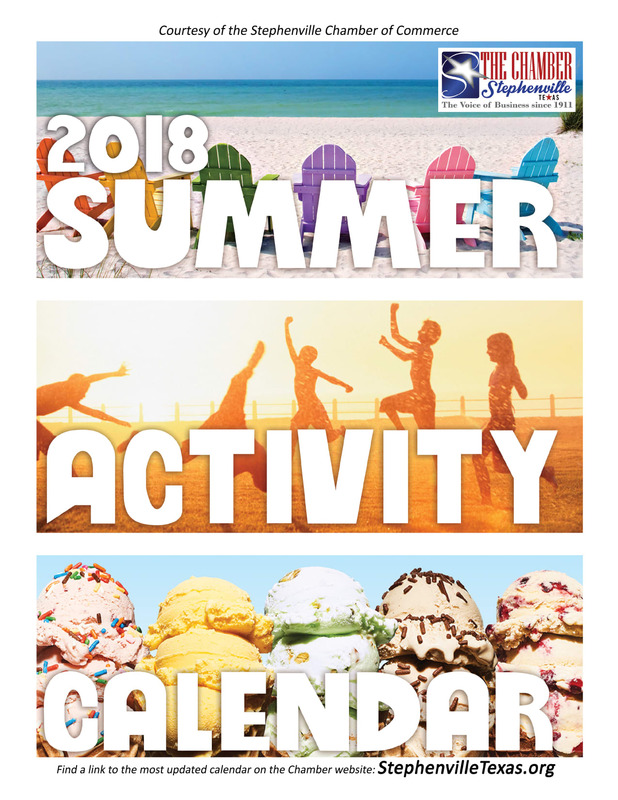 The 2018 SUMMER ACTIVITY CALENDAR has been compiled! Stephenville provides a wide variety of opportunities to keep your kids and the whole family educated and entertained all summer long! Please enjoy this listing of summer camps, vacation Bible schools, family activities, community festivities and much more - compiled by the Stephenville Chamber of Commerce. Click HERE or click the photo below to view and download the Summer Activity Calendar! Printed copies were distributed to area elementary schools and day cares May 10 & 11 - and are also available for pick-up in our Chamber Lobby on the Downtown Square. A HUGE thank you to our sponsors: Associated Well Services, Black Plumbing, Cici’s Pizza, Citizens National Bank, Complete Care, Dental Excellence, La Quinta, Mitchell Resort & RV Park, Oakwood Assisted Living, Saint-Gobain, Senior Care of Stephenville, Tarleton Campus Recreation, & TexasBank!